When a Hokie brewer saw a problem within the brewing industry, he did what Hokies do—turned his attention from crafting beers to crafting a solution. In 2014, John Bryce ’01 teamed with fellow alums Shane Kunkle ’00 and Jesse Pappas ’98 to found the Lupulin Exchange, an online secondary market for hops that experts say has revolutionized the industry. 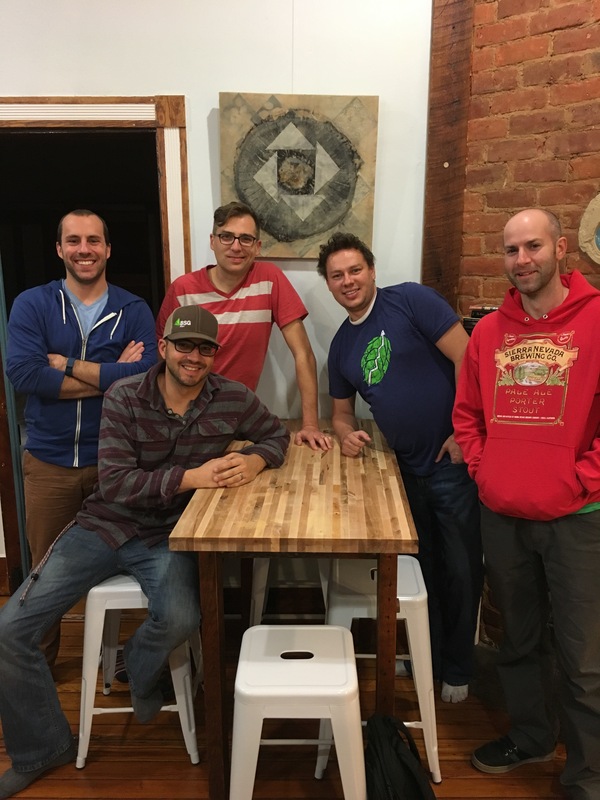 “It’s the eBay of hops for commercial brewers,” said Bryce. Since September 2014, the Lupulin Exchange has facilitated more than $25 million worth of hops transactions and worked with more than 4,000 breweries. The online business model allows buyers and sellers to list and shop for hops by crop year, type, and growing location. (Left to right) AJ Hoffer, Jesse Pappas ’98, Shane Kunkle ’00, Darren Kopp, and John Bryce ’01 make up the Lupulin Exchange. “Prior to the advent of Lupulin Exchange, spot pricing for open market hops was rather opaque, and pricing knowledge was limited to the price visible through individual transactions,” said Chris Swersey, Brewers Association supply chain specialist. Bryce said he first became interested in brewing while attending Virginia Tech. That interest led him to an unpaid internship with a brewery in Richmond following graduation. Combining his love for brewing and entrepreneurship with his love for Blacksburg, Bryce founded the New River Valley’s first microbrewery in 2002 when he was just 23 years old. “I never, ever would have gotten that first business off the ground without that finance experience [from Tech],” Bryce said. Bryce has since worked in varying capacities at several Virginia breweries, including Capitol City, Old Dominion, and Starr Hill. He graduated from the German brewing school Versuchs- und Lehranstalt für Brauerei (VLB) in 2008 and is the voice of the popular Master Brewers Podcast, which Bryce produces for The Master Brewers Association of The Americas (MBAA). Prior to the global hops crisis in 2008 , Bryce said he could just pick up the phone and locate specific varieties at will. Immediately following the crisis, nearly every brewery signed hop contracts with dealers, but forecasting growth and needs became a major challenge during the industry’s period of explosive growth. With no secondary market at hand, Bryce struggled to find the hops he needed and to unload those of which he had a surplus. “I’m supposed to be running a 20,000-barrel brewery, but the next thing you know, I’m spending an entire work week selling hops via email,” Bryce said. As Bryce began to envision a more efficient way for buyers and sellers to connect, he realized he would need a different skill set to structure the solution. Bryce tapped into his Hokie network, reaching out to Kunkle, his former roommate, who had majored in computer engineering. Kunkle, who has helped build multiple successful software companies and is currently the chief operating officer at DevResults, said though the timing of the call wasn’t ideal, Bryce’s passion and knowledge won him over. “The only way I’m getting involved in companies these days is with someone like a John Bryce who gets the industry inside and out,” Kunkle said. To lighten his load, Kunkle brought another software engineer with him, Darren Kopp, the only non-Hokie of the founding four. The team also added Pappas, whose background in restaurant and bar management along with an education in psychology postured him as the public lead of the Lupulin Exchange. “When you put those things together, you get a very complementary team,” Pappas said. And one Pappas credits to their alma mater. “Virginia Tech and Blacksburg really provided the foundation for our friendship and our partnership,” Pappas said. While the Lupulin Exchange has already had an impact on the secondary market for hops, what really excites Bryce and his co-workers is the potential of the information generated on their platform. “The data we’re collecting is unbelievable,” Bryce said. “In a few years, I think we’ll be able to help large-scale merchants and growers make better decisions about planting hops, meanwhile improving the brewer’s ability to forecast and make better contracting decisions. “The Lupulin Exchange is way cooler than anything else I’ve done,” he said.